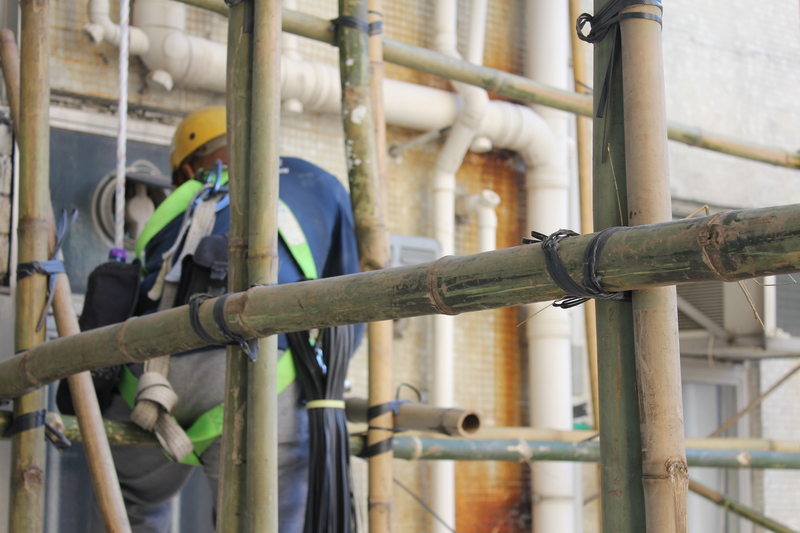 A city of breathtaking skyscrapers has been built, renovated and maintained using an impressive natural resource – bamboo. ‘Taap pang’ AKA the dudes-who-scale-the-sides-of-buildings erecting these scaffolds can regularly be seen climbing monkey like up and down the sides of scarily high buildings. And no, they don’t wear any kind of harness, merely relying on their own nimble extremities to get them up and down. 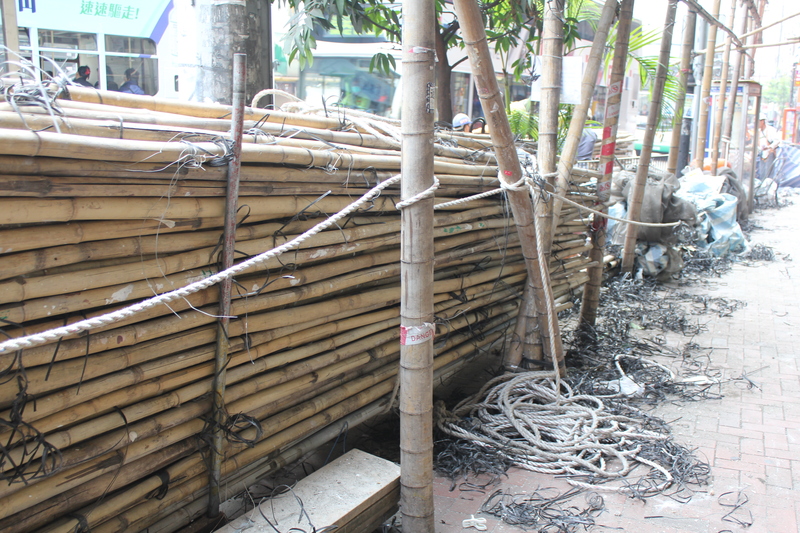 The 23-foot poles arrive at the worksite, are plonked on the ground in piles and are passed up from the ground, often by women and men of quite advanced age, and kinda shimmied up the the sides of the buildings using a combination of ropes and hands. Said poles are then tied together using what look disconcertingly like those twistie-tie things that adorn the tops of bread bags. 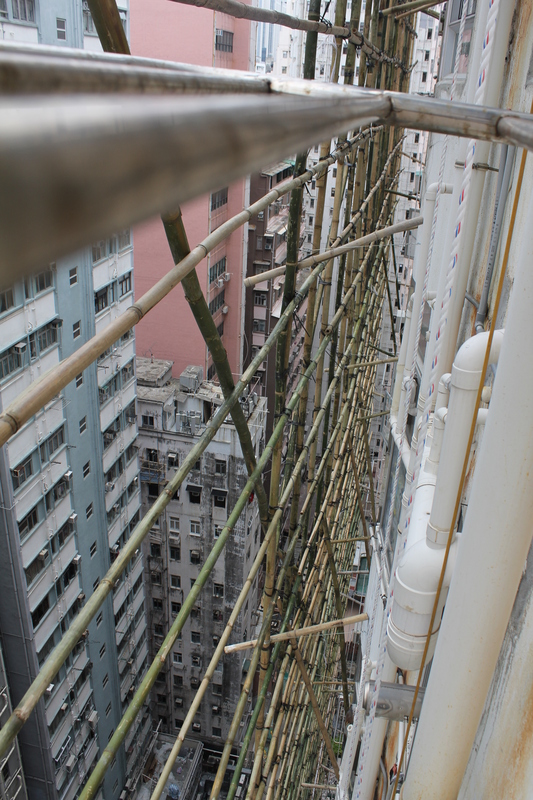 The last step is the covering of the scaffolding with sheer gauze-like material – why, we’re not quite sure. But the end result is buildings, depending on the colour of the material, looking somewhat like wrapped gifts. 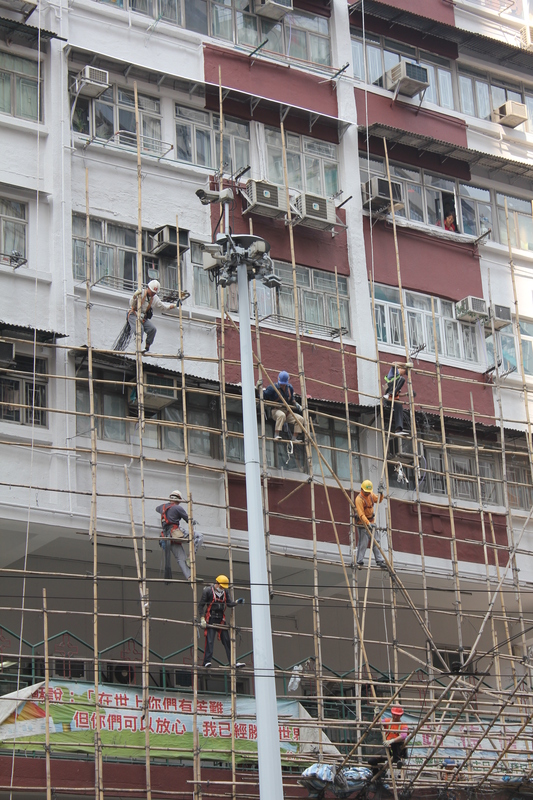 Obviously, you can’t help but notice these oddities all around you, wherever you happen to be in Hong Kong. But recently, we received note that our building would be undergoing renovation and we had a first-hand insight into the process. The first thing that struck was just how quickly these go up – the job began on the dot of 9am one weekday morning and at approximately 2pm that same afternoon a face appeared at our kitchen window, while we were innocently making a cup of tea. 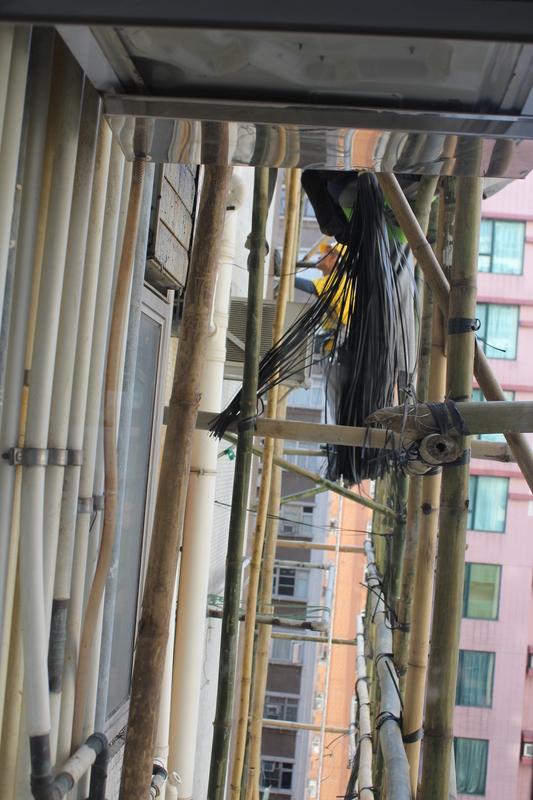 Even when you’re anticipating the scaffold going up, NOTHING can prepare you for the sight of a face at your 19th floor window. Weeeeeird. 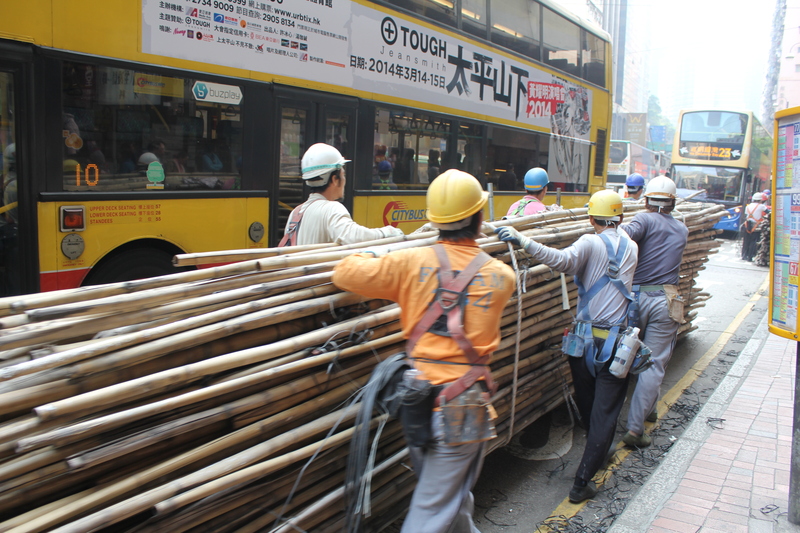 There’s not much else to say about all of this, other than what happens when its time for the scaffolding to come down…which is that it rains little bits of plastic down on the streets below, landing on the footpath, the road, your head while you’re standing at the bus-stop. 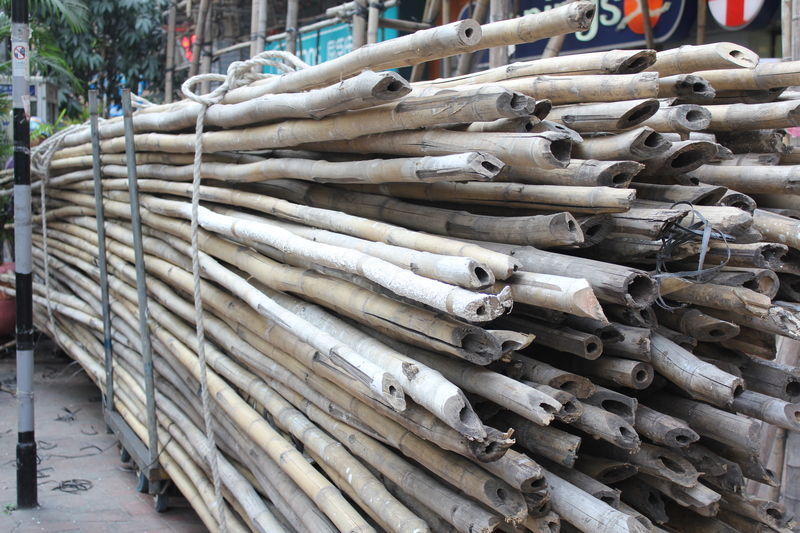 And just as fast as the bamboo poles go up, the bamboo poles are handed down back to the street level from whence they come. They are incredible, aren’t they? 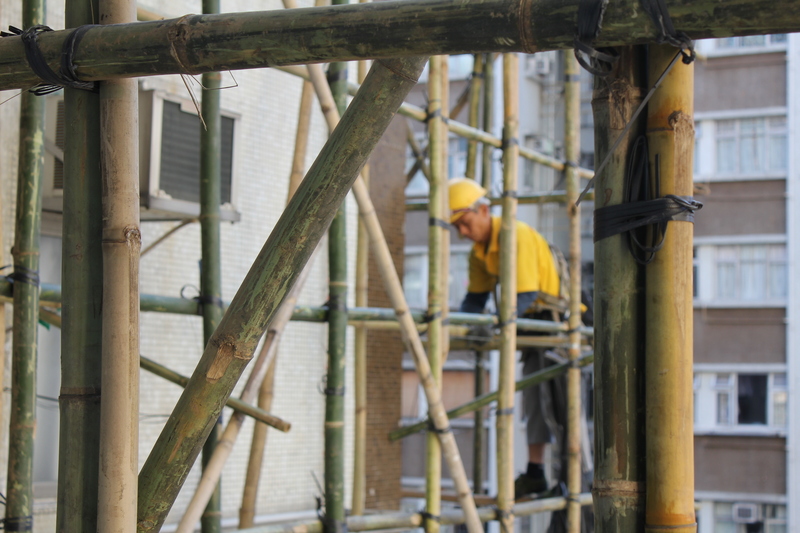 How they can even build skyscrapers with those bamboo scaffolding just amazes me to this very day. 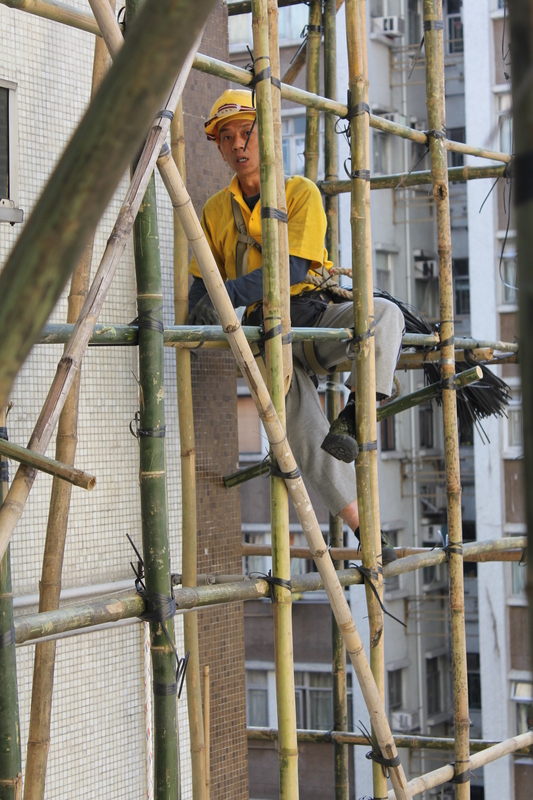 I got to respect those men working up those bamboo scaffolds. I would have been a goner for sure. Massive respect…If I even made it to the top I would NOT want to come back down. Freaky. Dan, however, would probably scale it like the semi-primate he is, hehe. We can totally understand why so few workers are lining up for the job these days. Though suppose there might be a few perks depending on what the occupants are wearing, eh?! Haha. Bamboo!!! Wow impressive. I have seen wooden ones in Egypt. In Norway it is only steel…. Same back in New Zealand, only steel, with big bolts keeping it altogether, not to mention the fact that every single part of the process is regulated to the hilt. And we have NOTHING anywhere near as big as so many of the buildings here…mind-blowing. This is totally blowing my mind. I can’t wait to show this post to my husband, he is going to freak out. And starting at 9am to finish at 2pm??? Daaaaayum!!!! That’s how the Asians do it!!! Hell yeah! I remember seeing this when I was there – astounding to witness! crazy, I wonder how many fall and die from this? Nicely captured, well done! It’s just a shame that this hard job is not paid well, I’ve read that young recruits start from HK$350 a day, while old hands can make around HK$10,000 a month. Wow, that’s not much ‘danger’ money, is it?! no, it’s very low pay considering all the risk they are taking!